It’s the month of good eating resolutions. One of the easiest to follow: add more salads. Whether it’s a main salad or a side salad, just avoid creamy dressings, stick to vinaigrettes, and you’re set. One of our favorites is a Greek Salad, so here are some ways to approach it—and get creative ideas for your own favorite salad(s). 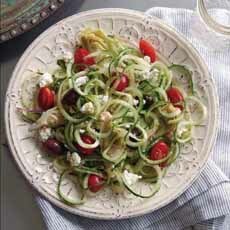 This salad (photo #1) has classic ingredients with a variation in texture: Get out your spiralizer and spiralize the cucumbers, instead of slicing them. It adds a fun element with different texture that leads to a slightly different taste experience. Be sure to drain the spiralized cucumbers on paper towels to keep water out of the salad. Other salad vegetables to spiralize—and one fruit—are apple, beet, bell pepper, carrot, red onion and zucchini/yellow squash. What about tomatoes? hard to find decent tomatoes in the winter, so look to cherry tomatoes or sundried tomatoes, plumped up in olive oil. Thanks to The Pampered Chef for this recipe. 1. MAKE the dressing: Whisk together all the ingredients and set aside. 2. SPIRALIZE the cucumbers. Snip the cucumber noodles occasionally to shorten the strands. Place the cucumbers on paper towels and blot any excess moisture. Allow the excess water to drain prior to assembling the salad. 3. SPIRALIZE the red onion, then cut the spirals in half. Rinse the spirals under water to remove the bite. Drain and set aside. 4. SLICE the tomatoes in half. Combine the cucumber, onion, tomatoes, artichoke hearts, olives, and cheese in a large bowl. Toss to combine. 5. DRIZZLE the mixture with half of the salad dressing and garnish with oregano. Serve the remaining dressing on the side. ADD 1 ounce (30 g) finely grated Parmesan cheese to the dressing. Spiralize your cucumbers, zucchini, carrots, etc. (photo and recipe courtesy The Pampered Chef). Adapt the style of another favorite salad, the Cobb Salad. Here, the Greek Salad ingredients—feta, olives, onions, tomatoes—substitute for traditional Cobb ingredients—avocado, bacon, hard-boiled eggs and roquefort cheese (photo courtesy The Tuck Rooom | L.A.). 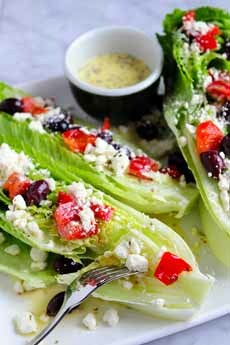 Make your salad sliceable: Use romaine “boats” as the base to be covered with the other ingredients (photo courtesy DeLallo). 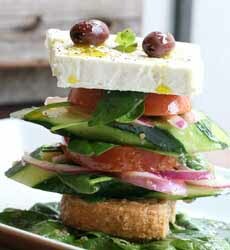 Get fancy with this vertical—horiatiki is a Greek salad without the lettuce. The word means village salad or rustic salad (photo courtesy Death Ave | NYC). 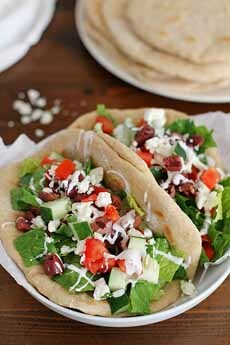 Familiar ground: Greek salad in a pita. Here’s the recipe from Girl Versus Dough, using homemade pita. 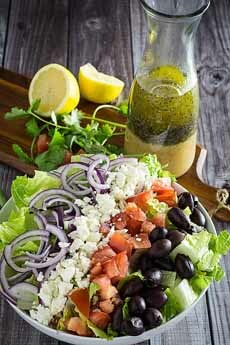 This Greek style salad contains all the ingredients you’d expect, like feta cheese, tomatoes, and cucumbers. The dressing is authentic, too. The only difference is that lettuce doesn’t grow well in Greece year round so people tend to leave it out of salads if it isn’t available.